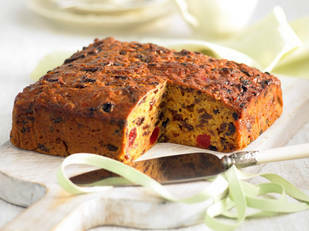 This boiled pineapple fruitcake is an golden oldie - never fails, always tastes magnificent - a sure way to impress. Line a deep 20cm round cake tin with two thicknesses of greaseproof paper, bringing paper 5cm above edges of tin. combine undrained pineapple, chopped fruit, butter, sugar, spice and soda in pan. Stir over heat until sugar is dissolved. When cold, add eggs and sifted flours, and mix well. Bake in moderately slow over 1 1/2 to 2 hours. Cover, leave in tin until completely cold. Remove from tin, leave lining paper intact. Refrigerate in airtight container for up to a week.